Bukhari rice is very popular in Arabian cuisine and is a wonderful combination of rice, meat, raisins and carrots. 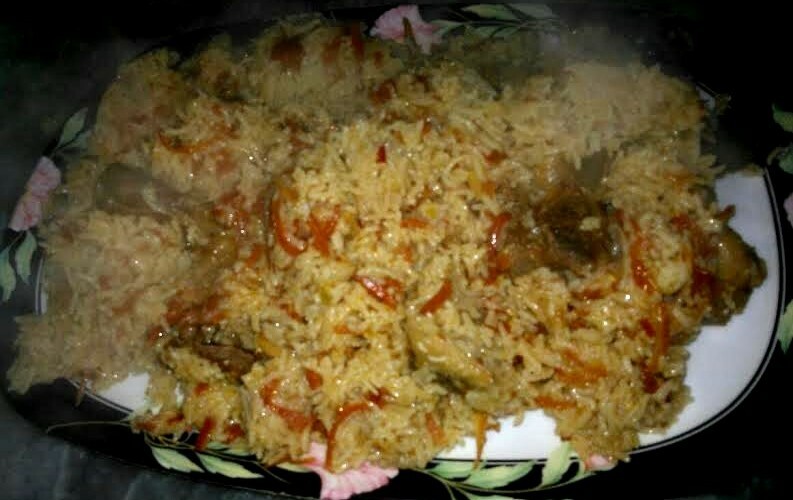 Serve these rice with spicy tomato sauce which enhances its taste. Heat oil in a large pan & add sliced onion. Fry on medium heat till light brown in color. Add mutton pieces & ginger garlic paste. Stir fry for 5 min. Add salt, green chilies, tomatoes, turmeric powder, coriander powder and cumin powder. Cook on medium heat for 5 minutes. Now add 2-3 glasses of water and cook on medium heat for 50-60 minutes until the mutton is tender. Add the carrot strips and toss altogether. Add 3 glasses of water in the same pan and bring it to boil on high flame. When its start boiling, add rice. Cook on medium heat until the water is almost absorbed by the rice. At this point you can check the salt and adjust it according to your taste. Cover the pan with lid and cook on low heat for 8 to 10 minutes (this will allow the rice to set and helps the flavors to develop). Turn off the heat and serve with spicy tomato sauce. ENJOY!